If you somehow, in the year of our lord 2018, still don’t understand that Facebook is a spewing cauldron for misinformation and Russian propaganda which you should leave immediately (seriously, take your family members and run!) boy does the New York Times have a story for you. Sandberg has built her personal brand on a particularly aggravating strain of capitalist empowerment feminism, one that is built for rich white women who seem to only view feminist progress in terms of their individual success climbing the corporate ladder and making bank. 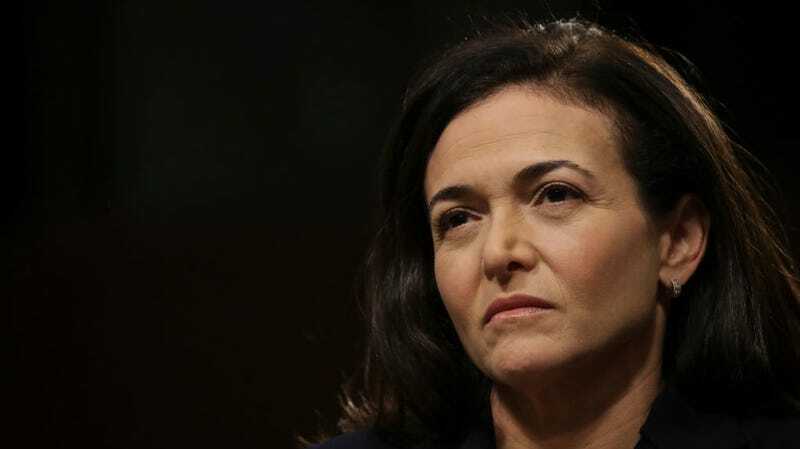 And Sandberg’s commitment to her brand couldn’t have been clearer in the Times article, which described her actively withholding information from users about the misuse of their personal data and how invasive Russian interference has become on the platform—all to protect Facebook and herself. The NYT reports that when Trump posted a statement in 2015 about how Muslims and refugees were a danger to Americans, Zuckerberg questioned if the future president was violating Facebook’s terms of service. Sandberg directed the question to a team she had assembled to deal with such problems, which included her Republican friend Joel Kaplan, who went to Harvard with her. It was Kaplan who argued to keep Trump on the platform and not censor him, and so that’s what happened, with little to no interference from Sandberg who “barely spoke” during meetings about what to do with Trump. When Facebook’s security chief Alex Stamos uncovered Russian interference on the site in 2016, he assembled a team to investigate it further. And when they pushed Facebook to publish a paper with their findings Sandberg and Kaplan objected, suggesting that taking down fake Russian pages would anger Facebook users who were lied to. When the paper was eventually published Russia was never even mentioned, and it would not be the first time Sandberg fought to obscure, as much as possible, the ways in which Russian trolls had invaded Facebook. By August 2017, Facebook executives realized they had a “five-alarm fire” on their hands after a Times journalist reached out about Facebook accounts with ties to Russia. Zuckerberg and Sandberg went public with the findings, but not before Sandberg kept arguing the post should be less specific. When it went up it didn’t say much about fake accounts or viral posts created by Russian trolls. Not only did Facebook and Sandberg continually withhold information from the public about how much fake news there was on the platform, they also hired a Republican group to combat critics with fake news. The NYT reports that Facebook worked with Definers Public Affairs who published, through their affiliate NTK Network, a series of articles calling out Google and Apple for “unsavory” business practices, while one article made it seem like Russians weren’t really messing with Facebook. Definers was also instrumental in spreading the idea that George Soros was spreading a Facebook hate campaign. After Senator Amy Klobuchar introduced legislation to get Facebook to disclose who buys political ads on the site, Sandberg even apparently got her to stop criticizing the company on Facebook (though Klobuchar did not change her legislation). The Times report is a long, dizzying read, and one which really underscores not just how slimy Zuckerberg has been in handling Facebook’s misinformation problem, but also how aggressive Sandberg has been in trying to bury evidence of the situation. Perhaps, it is time, for her to lean out.